A deviled egg carrier can make a simple task out of transporting a difficult food. Devilled egg carriers will safely hold each egg in a small well designed to keep them from tipping, slipping, or rolling. They can be just as handy while making your devilled eggs and serving them as they are for storing them. They come in a variety of shapes and sizes with numerous special features that make each carrier unique. You won’t have any trouble finding the best deviled egg carrier for your needs with the help of the following information. The Progressive Prepworks Collapsible Deviled Egg Carrier has an attractive appearance, and it can easily hold up to 28 deviled eggs. You will be able to transport your eggs without the fear of them rolling over and creating a big mess before you reach your destination. The great thing about this particular deviled egg carrier is that you can use it for many other types of food as well. It can carry two nine inch pies at one time, or you can transport a single large meringue pie without ruining the beautiful whipped egg topping. The way this carrier works is by utilizing the removable trays. The top tray can be reversed from a flat pie holder to a tray that has 16 indentions to secure deviled eggs in. The bottom tray is capable of holding an additional 16 eggs. The collapsible cover can be expanded to make more room for your larger goodies such as those perfect meringue pies that are normally so hard to fit in to a carrier. The base, cover, and two trays are all separate pieces. They are all dishwasher safe for easy clean-up. When the trays are flipped to their flat pie carrier side you will find a ring that keeps your pie plate from sliding around inside of the carrier. The full piece measures 14 by 7 inches, and it has a shipping weight of 2.3 pounds. All of the pieces are created from BPA free plastic, and it comes in the color red. It is manufactured by Progressive in the United States. Online reviews are quite favorable for the Prepworks Collapsible Deviled Egg Carrier. Many were surprised at how large it was. It easily holds two pies or 28 eggs. Most egg carriers are limited to the amount of eggs they will hold. This makes the Prepworks version much better suited for parties or any function where you will be serving large amounts of food. Two nine inch double crust fruit pies or pecan pies will easily fit inside of this carrier with plenty of room left for pie plates that include handles. Those that own these particular carriers recommend holding it from the bottom when carrying it. It does have snapping closers, but if you use glass pie plates, the added weight could possibly be too much for them. No one seems to have any trouble with the snaps or handle when using this piece as a deviled egg carrier. Some people have said that they also use this for their basic layer cakes and frosted cookies without any difficulty. 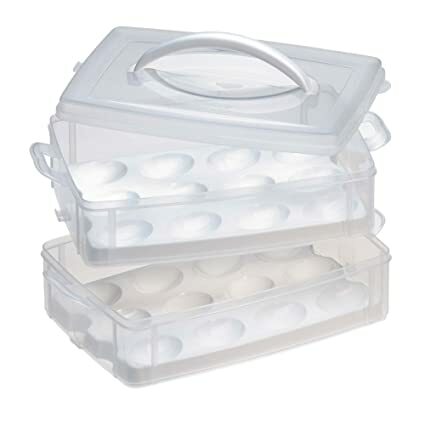 The entire deviled egg carrier by Progressive collapses for easy storage when not in use. It also saves space when storing deviled eggs or pies in the refrigerator due to its two layer design. Rather than taking the usual shelf space for two pies or two trays of eggs, this carrier will only use the amount of space needed for one item when both layers are utilized. Each of the egg trays can be left inside of the carrier and used as serving trays as well. Simply remove the lid. Over-all, the versatility of the Prepworks Collapsible Deviled Egg Carrier makes this piece a huge hit with many home cooks. The Stack N Snap Deviled Egg Carrier provides a simple way to transport or refrigerate up to 24 deviled eggs. The durable handle makes it easy to carry, and the clear plastic allows you to see what you have inside of it with a quick glance. It has two layers. Each layer consists of a rectangular holder with an egg tray that sets down on the bottom of it. Each individual tray holds 12 eggs. The layers can be stacked, and they snap together with the clips on each end. 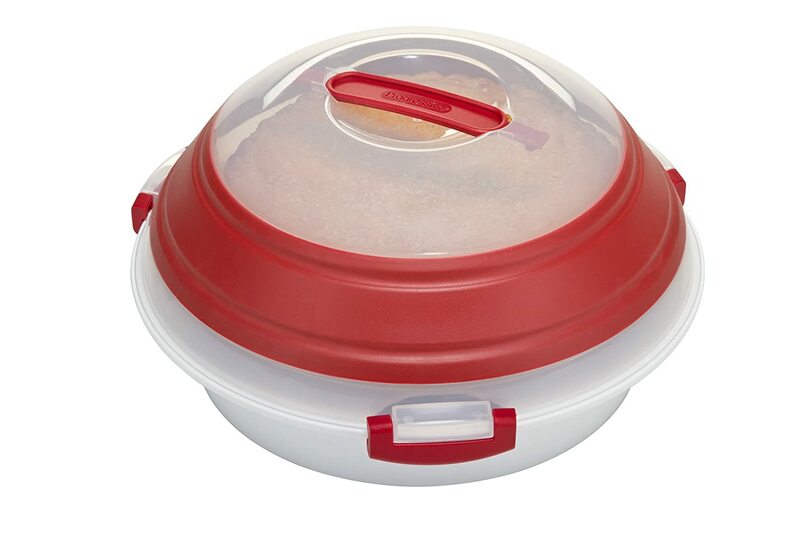 It is topped off with a brightly colored lid with handle that also clips on. The lid can be used on a single layer for storing fewer eggs. This egg carrier measures 10 by 7 by 5.5 inches when completely assembled. It weighs one pound, and it is manufactured by World Kitchen in the United States. People often buy two sets because they can be snapped together to create an even larger deviled egg carrier. In addition to eggs, this carrier can be used for other food items too. If you remove the deviled egg trays from the bottom of each section, it easily holds cupcakes with ample room for the frosting or other decorations. Each layer will hold up to eight cupcakes, and it works perfectly when taking them to school functions, birthday parties, or other gatherings. Online reviews rave about the size of the Stack N Snap Deviled Egg Carrier. It is just small enough to comfortably carry alone, but it still holds plenty of eggs. The straight edge design will allow it to fit nicely inside of a cooler or tote bag without taking up to much space. This is also an excellent feature when it comes to storage. The handle folds down flush into the lid to save even more space. Many creative home cooks that already purchased this carrier have commented on how many uses they have found for it. One woman uses the bottom layer for potato salad, puts her deviled eggs in the top layer, and pops it in the cooler. She has everything she needs for her picnic in one simple storage piece. Others have found it perfect for cookies, fudge, and other sweet treats as well. It even comes in handy for those who have chickens and are looking for a compact way to store the eggs they collect. During the Easter holiday you can keep your children’s colored eggs protected and safe. This carrier will work especially well for anyone that uses public transportation. Many online posts are from people that live in the bigger cities. They are so pleased to finally have a food carrier that is versatile and fits on their lap when travelling. The indented wells in each tray keep deviled eggs firmly in place without allowing them to roll around or fall over. The trays can be removed and used as the actual serving tray too. All five pieces that come with your initial purchase of the Stack N Snap Deviled Egg Carrier come apart for easy clean-up and washing. The Prodyne IC-24 Iced Eggs Platter will allow you to keep your deviled eggs out during parties and social gatherings without the fear of spoilage. This handy device will keep eggs chilled for hours. The upper tray is constructed of stainless steel with wells for up to 24 deviled eggs. Each of the indented wells will keep your eggs from slipping into one another or falling over. The entire tray rests on an acrylic lower tray that can be filled with crushed or cubed ice. This is the ideal serving piece for any picnic or dinner. This Iced Eggs Platter is manufactured by Prodyne in Taiwan. It measures 17.5 by 12 by 2.5 inches, and it weighs one pound. Unfortunately, the bottom tray cannot be used as a lid, but it will serve double duty as a second serving tray when not being used to hold ice. It could also be turned upside down to cover the eggs, but it will not snap into place. Those who have posted online reviews are very happy with their Prodyne IC-24 Eggs Platter. It has an attractive appearance that many of the plastic carriers do not have. It fits in nicely with other serving dishes. The stainless steel finish coordinates with many different types of dishes and serving pieces without standing out as being unsightly. People who have already purchased and used this particular egg platter state that it truly does keep deviled eggs chilled for several hours. It is ideal for outdoor parties, picnics, and warmer climates. Many home cooks have used the tray for appetizers as well as deviled eggs with great success. Anything that needs to be held in place without slipping and sliding can benefit from the welled out design as well as being kept cold without fear of going bad. This particular product is made of high quality materials and has a durable design. The welled tray where each egg will rest is constructed of 18/8 stainless steel while the lower ice tray is made from BPA free acrylic. Each individual piece can be easily hand washed to keep it looking like new for years to come. The whimsical egg shape of both pieces will add interest when serving your deviled eggs. This feature also makes the Prodyne IC-24 Iced Eggs Platter perfect for the Easter holiday when displaying colored eggs. 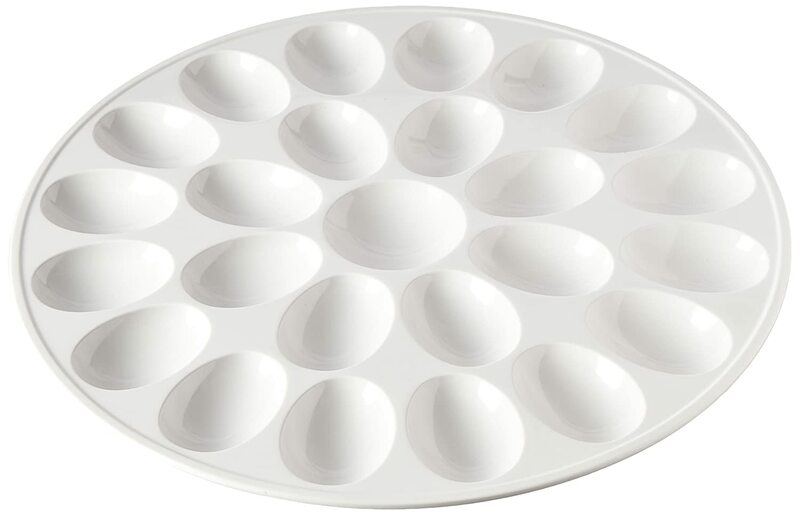 If you are simply looking for an attractive platter to hold your deviled eggs, the Zak Designs 12-Inch White Melamine Egg Tray will be perfect. Best of all, it doesn’t cost very much. The low price point makes it ideal for those who need to purchase additional trays. The durable melamine construction gives it the look of a ceramic plate without the weight or fear of it breaking. It will easily hold up to 24 deviled eggs which are twice as many as the average egg plate. It is dishwasher safe for easy clean-up. There are 24 wells in this tray to hold each devilled egg securely in place without allowing it to tip over or roll into the other eggs. The center well is an additional round one where you can place a garnish in order to dress up your presentation. The over-all size isn’t as large as you would expect. It measures 12.2 by 3.4 by 12.4 inches. This allows it to fit on your table nicely while leaving room for plenty of other serving dishes. The entire piece weighs 13.6 ounces. It is manufactured by Zak Designs in China. In addition to being an excellent serving tray for picnics, parties, dinners, and other special gatherings where you will be serving deviled eggs, this tray is ideal for displaying colored Easter eggs. The plain white color allows the decorated eggs to be the star of the show without causing any distraction. The Zak Designs Egg Tray does not come with a cover. Those who own this platter recommend using a plastic wrap over it for transportation and storage in the refrigerator. Some have left the paprika off of their deviled eggs until they are ready to serve. Doing this after removing the plastic wrap will keep them looking their best and camouflage any marks left behind. The melamine construction creates a sturdy egg tray that will sit flat on your table. Along with holding deviled eggs, this tray can be used for Easter candy, Jell-O Jigglers, and other egg shaped treats. Online reviews highly rank this piece. They state that it is a beautiful serving dish for a very low price. The over-all value you get for the money spent makes purchasing this item a good investment. The flat design will allow you to easily store it in any kitchen cupboard. It stacks with other plates and platters nicely or you can stand it on end. The very first thing you will need to consider before purchasing a deviled egg carrier is exactly how many eggs you will want to carry. The average deviled egg recipe uses six eggs to create a full dozen deviled eggs. This is why the average egg carrier will only hold 12 deviled eggs. If you are looking for something to use for parties and other large gatherings, you may want to look for one that holds 24 eggs. Some egg carriers will feature separate layers. Each layer may hold 12 eggs. With these designs, you can simply remove any layers you won’t be using. Not all devilled egg carriers and trays will come with a cover. This isn’t a very big problem if you plan to make and serve your eggs at home. If you are more likely to be transporting your deviled eggs to other locations for picnics, holidays, and parties, you will definitely need a cover. The ideal cover will snap onto the egg carrier and have a durable handle to make it easy to carry. Deviled egg carriers that are square or rectangular will fit nicely into your cooler or tote bag without taking up to much space. A handle that can fold down flush to the top of the lid is also a great space saver. Those who are looking for a little whimsy in their deviled egg carrier can find several varieties of egg platters in egg shapes. When the Easter holiday comes, you can even find them in the shape of bunnies and baskets. Many of us will only be making deviled eggs for special occasions. It often doesn’t fit into ones budget to buy a carrier that will only be used a few times throughout the year. You also have to consider the fact that you will have to find a place to store your carrier when you are not using it. Deviled egg carriers that serve more than one purpose can be an excellent investment. Egg carriers will often hold pies, cupcakes, cookies, and other treats as well as your deviled eggs. This can save you time, money, and space. A very common and useful feature found with deviled egg carriers is their ability to also work as a serving tray. There is usually a removable tray inside of the carrier with wells for each egg that can be lifted out and set directly on your serving table. You can also find egg carriers that will keep your deviled eggs chilled for several hours. These designs come with a second tray that can be filed with crushed ice and placed under the carrier. If you are looking for a versatile piece that will safely carrier you deviled eggs, the Progressive Prepworks Collapsible Deviled Egg Carrier will be perfect. It carries up to 24 eggs or two nine inch pies in a sturdy case with lid and handle. When you aren’t using it, it will collapse for easy storage. A similar deviled egg carrier is the Stack N Snap Deviled Egg Carrier. This one holds 24 deviled eggs in a two layer, stackable design that keeps your eggs from sliding and rolling. Those who want to know their eggs are protected as well as safe to eat after sitting out will enjoy the Prodyne IC-24 Iced Eggs Platter. Crushed ice can be added to the lower tray of this carrier in order to keep foods chilled for several hours. On the other hand, if all you really want is an attractive way to present your devilled eggs, try the Zak Designs 12-Inch White Melamine Egg Tray. This affordable and beautiful serving piece will look lovely on your table at any time of the year.